Change image format of screenshots. Is there a better alternative to shotChoice? Is shotChoice really the best app in System category? Will shotChoice work good on macOS 10.13.4? 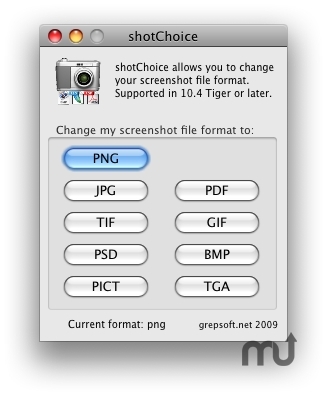 shotChoice allows you to change the file format of screen shots and screen captures as PDF, PNG, BMP, PSD, TIF or JPG. When you launch it it tells you down the bottom, which format you have currently set. I'll package it up and put it out soon. shotChoice needs a rating. Be the first to rate this app and get the discussion started!